Jesus: The Son of Man. 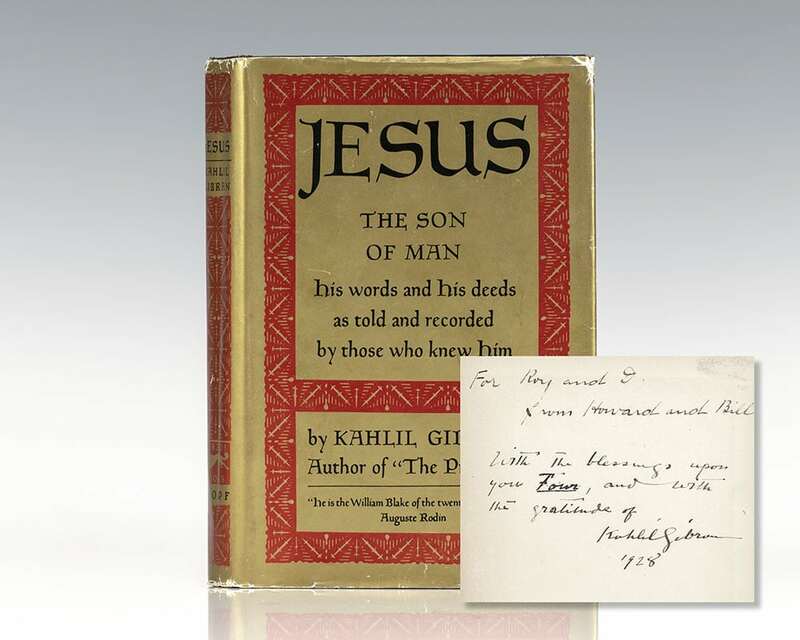 First edition of Kahlil Gibran’s masterful retelling of the story Jesus of Nazareth. Octavo, original cloth, illustrations by the author. Presentation copy, inscribed by the author on the front free endpaper in the year of publication, “For Roy and D. from Howard and Bill With the blessing upon you four, and with the gratitude of Kahlil Gibran 1928.” Near fine in a near fine dust jacket. Housed in a custom half morocco clamshell box. Rare and desirable inscribed and in the original dust jacket. 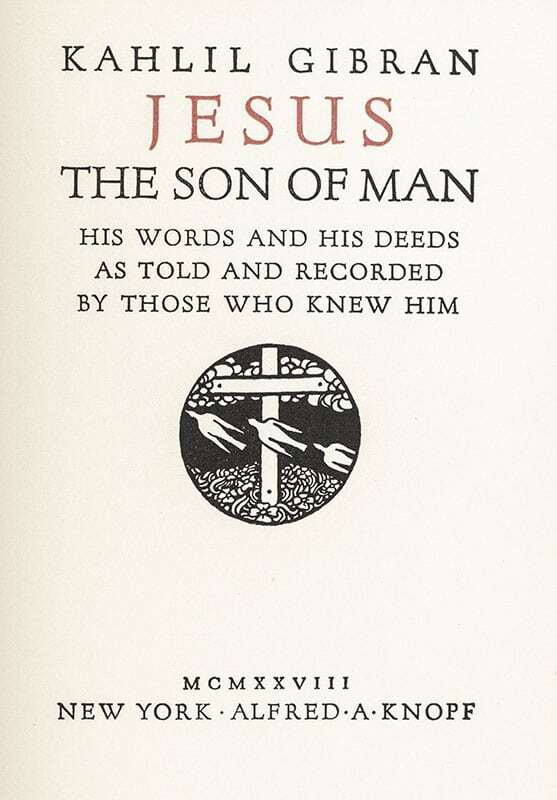 One of Gibran’s most well-loved works over 70 years after its original publication, Jesus the Son of Man is a striking fictional portrait of Christ as seen through the eyes of his contemporaries. Depicting a variety of famous figures, from Mary Magdalen to Pontius Pilate, Gibran’s spellbinding collection of narratives combines historical authority with the supreme eloquence that his admirers hold so dear. Fully conscious of the social, political, and religious realities of Palestine and Rome at the time, and at home with the local traditions and language, Gibran effortlessly evokes the spellbinding power of Christ’s presence upon his associates. Presented in an attractive gift format and accompanied by Gibran’s original artwork, this new edition allows Gibran’s inspirational account of Christ to be read once more. Sand and Foam: A Book of Aphorisms. New York: Alfred A. Knopf, 1927. Signed limited edition of the author’s classic work. Number 75 of 95 copies, signed by Kahlil Gibran. Illustrated with seven drawings by the author. In near fine condition, two small names to the front free endpaper. Housed in a custom made slipcase. A very sharp example. The Works of Kahlil Gibran, Including: The Prophet, The Madman, The Forerunner, Sand and Foam, Jesus the Son of Man, The Earth Gods, The Wanderer, The Garden of the Prophet, Prose Poems, Nymphs of the Valley, Spirits Rebellious, and A Tear and a Smile. New York: Alfred A. Knopf, 1962-1965. Finely bound by Sangorski & Sutcliffe in full red morocco, gilt titles to spines direct with two raised bands and gilt tooling, gilt-ruled board edges and turn-ins, marbled endpapers, all edges gilt. Illustrated plates by Gibran. Complete with each of the text volumes of his works as published by Knopf (originally between 1918 and 1950). In fine condition. 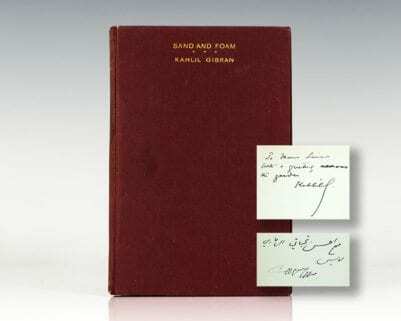 An attractively bound set of Kahlil Gibran. First edition of this powerful collection of aphorisms, poems, and parables from the author of The Prophet. Octavo, original cloth. Warmly inscribed by the author on the front free endpaper, “To Marie Luise, With a greeting across the garden, Kahlil.” Also laid in is a autograph signed two paged letter on his letterhead, completely in Gibran’s hand. It reads, “Good morning to you, dear Marie Lousie, and many blessings upon you. I have before me now a kindly number of your letters, and I feel quite rich. You see, I went to the country for a while, and while I was there no letters were forwarded to me. Everybody thinks that I must try and get out of the world as though I have never been in it. And they say that I am not well enough to do anything but lie on my back and be still. They are all stupid! I like the little photographs in your last letter very much. They make you seem quite dashing! The hair is infinitely better and, of course, more becoming. No doubt that at the end of October ‘your tresses, like molten gold, falling from heaven to the earth,’ will [be] a pleasant sight to the gods of this world—and the gods of other worlds. I am glad you still like the drawing. Who knows, I may make a better one next winter! And if I should do so, you would want it- and I will not give it to you- and that’s that!!! Always your faithful Kahlil Boston Aug. 28 1927.” In near fine condition.